Now that the weather has slightly warmed up, I’m ready for lighter, fruit desserts to embrace the season, starting with this Strawberry & Thyme Honey Custard Tart, in partnership with Fair Trade Certified to showcase the amazingness of Fair Trade berries and why we should all be trying to support and purchase them! Fair Trade is something near and dear to my heart, as someone originally from the Dominican Republic, where cacao and coffee are two very important products in our industry and our farmers getting fair wages for them is very important to me. So when Fair Trade USA approached me to create a recipe showcasing the work that Driscoll’s does to work with farmers in Mexico, I jumped on board instantly. 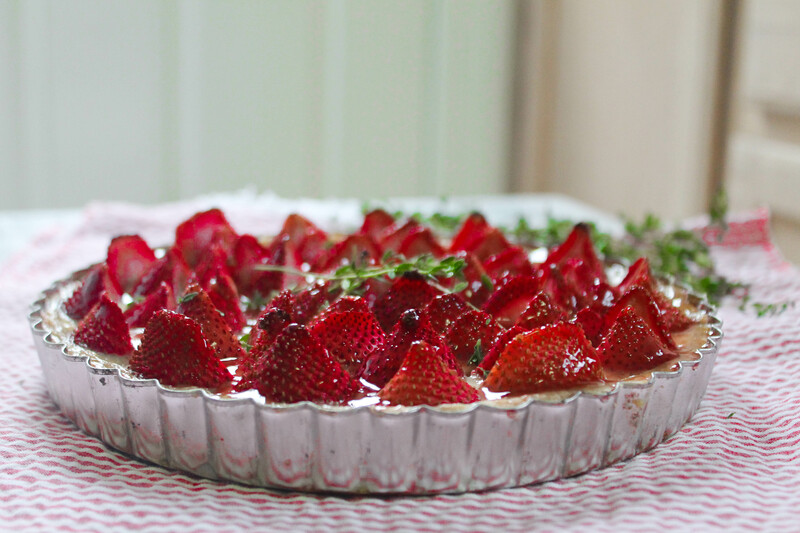 I wanted to create a simple yet delicious strawberry recipe and this Strawberry & Thyme Honey Custard Tart is just the thing! It might look impressive and time consuming, but that’s a six inch tart pan and a quart of berries – it takes under 10 minutes to put together and is a gorgeous dessert to serve to guests this season. It’s a Strawberry & Thyme Honey Custard Tart and that custard is divine even on its own – basically you steep milk with fresh thyme for about 30 minutes (more if you have the time for it) and then whisk it with eggs, honey, vanilla, and nutmeg to create a custard base that you will pour over the berries once the are assembled. A core benefit of Fair Trade certification is that additional funds are generated each time a consumer buys berries carrying the Fair Trade Certified label and 100 percent of those community funds are directed back to the farmworkers and the communities that grew the berries. More than 3,500 farm workers have been trained and two hundred thousand dollars in funds have been generated during the initial Driscoll’s Fair Trade Certified™ organic program. These funds are invested in things like health fair offering free medical services and distribution of school supplies. Find out more about Driscoll’s Fair Trade Certification Program here. Also, a note about Wholesome! because they are hands down one of my favorite sweetener brands to use: Wholesome! pioneered Fair Trade certification for sweeteners in the USA back in 2005. Since then, they have contributed $11 million in premiums to farms all across the globe. From Organic Cane Sugarin Paraguay, Organic Blue Agave in Mexico, Raw Cane Sugar in Malawi, and Organic Honey in Brazil, they are proud to support Fair Trade and the hardworking, deserving, farming families who benefit from the premiums. Now that you understand why fair trade strawberries are important, can we talk about this custard? It’s so delicious because steeping the milk with the thyme adds a depth of flavor you’ll love and the honey really rounds it all out. A hint of nutmeg and vanilla and you’ve got the ideal dessert! 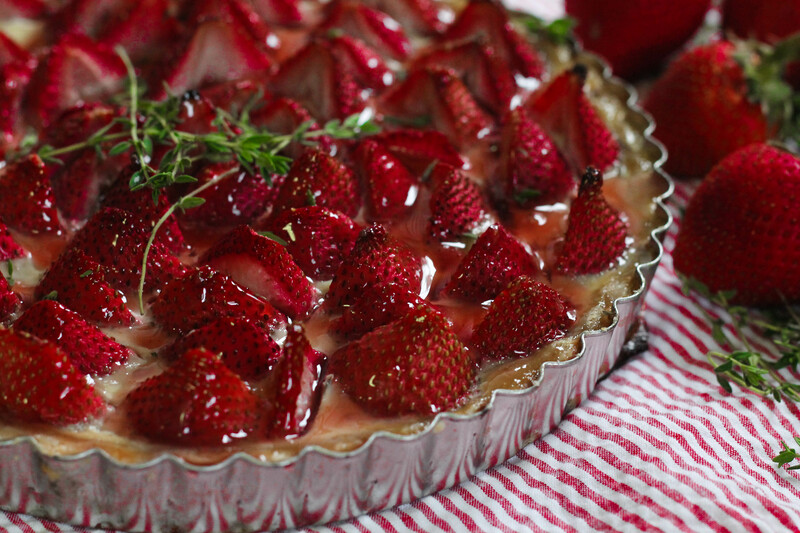 Let me know if you make this quick and easy strawberry custard tart recipe! 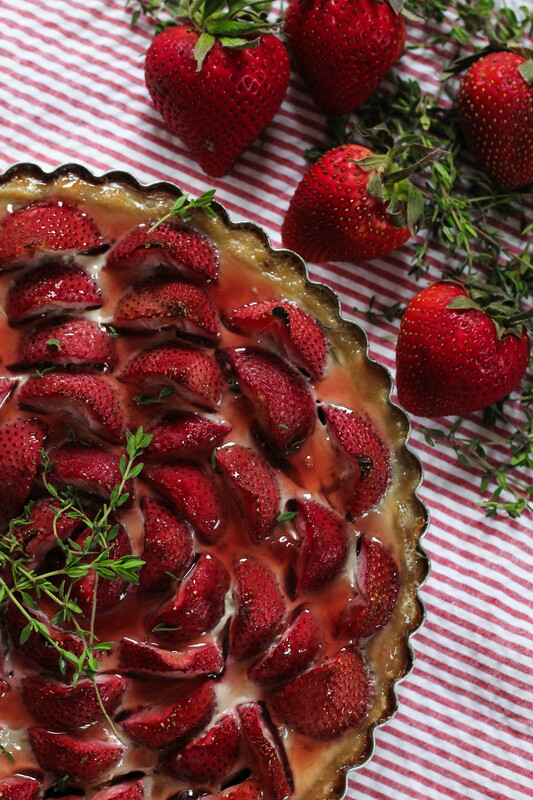 This Strawberry & Thyme Honey Custard Tart is just the recipe to welcome spring into the neighborhood! In a small saucepan, simmer the milk and thyme until it bubbles. Turn off and cover for 30 minutes. Press the pie crust into a 6 inch tart pan - you will have leftover pie crust since this is a smaller pie pan than usual. Bake for 10-12 minutes until par-baked. Let cool for 10 minutes, while you cut the strawberries. Remove the stem of the strawberries straight down with a knife and cut in half lengthwise. Start aligning berries against the tart crust, forming circles with them. Arrange until the pan is filled. Place tart pan on sheet tray. Whisk the honey, nutmeg, vanilla, and salt into the milk. Strain the mixture into the whisked eggs and whisk until combined. Strain again. Slowly and carefully pour the mixture over the berries. Bake for 30 minutes or until custard is set. Heat up the glaze by combining jam and water in a small saucepan and then use this to brush over tart. Serve with a sprinkling of extra fresh thyme leave and enjoy! Disclaimer: This is a sponsored post on behalf of Fair Trade USA – a movement I stand behind 100% and would love for my readers to learn more about, to support farmers all over the world.